Jester Queen Ayrenn is an Orc impersonating Queen Ayrenn during the Jester's Festival event. She can be visited first to garner an introduction to the Jester's Festival, and her quest is obtained by visiting her at the festival stage north of Vulkhel Guard. She will ask you to spread merriment to grumpy temple-goers, residents of Skywatch, and professors of the College of Aldmeri Propriety. 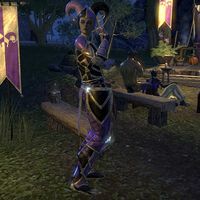 She is also found at the festival tents in Ebonheart performing on stage with Jester King Emeric and Daggerfall with Jester King Jorunn respectively. "Oh, another doting vassal! I simply am the most adored creature in the world, aren't I? But it is my burden to bear. You no doubt want to thank me for this wondrous celebration. Very thoughtful. Thank away." Thank you, but what are we celebrating? "Oh my! An innocence to rival my own! You are so fortunate to learn of the Jester's Festival from someone virtuous as I, and not a cad like Emeric! Here we put aside decorum to embrace whimsy... and mischief!" "Oh goodie! I'm so glad I've piqued your interest! Now, how best to have you serve your Queen... I know!" If you arrive from Stonefalls after being sent to Vulkhel Guard by Jester King Jorunn. "Oh! You are that daring matchmaker who put a smile on Jorunn's face! Perfect, I have need of a merry-maker!" I heard you had a vital mission for me? "I have the perfect mission for you, my doting vassal. You'll love it almost as much as me." "I have decreed happiness, but not all of my kin share my breezy disposition and it's putting a damper on my festivities. I won't have my fun ruined by these grumpy... grumps! I need a champion to enforce my royalty mandated cheerfulness." "If these treasonous malcontents insist on harboring sticks firmly in their hindquarters, then they can at least have the decency to keep them in bloom! Find the grumps in my domain and pelt them with these enchanted petals until morale improves!" "I want you to have these grumps in stitches, one way or another!" Does the queen know you're impersonating her? "Impersonating? Don't you recognize your perfectly adorable high lady of Elven grace?" "So I am! Some fiendish festival hex, no doubt. Oh, my poor glowing complexion! I suppose I'll just have to make the most of these rippling muscles and incredible tolerance for wine." How does throwing these petals at people help with the Jesters Festival? "This is a holiday about not taking anything too seriously, even royalty! It comes more naturally to some than others, so we silly celebrators often have to give them a nudge. These hold outs will find it hard to be serious plastered in flowers." What's the real story behind the Jesters Festival? "I don't know that there are any true stories behind the Jesters Festival. Some say it happens because Sheogorath turned the whole world mad! Others say it sprung from Mer wanting to know what it's like to live like Men. If you speak to her before heading down to Vulkhel Guard, she will say: "I want you to have those grumps in stitches, one way or another!" "My champion of cheer returns! Have you vanquished the stubborn seriousness in my land?" The grumps have been cheered, my queen. "Delightful! It's so much nicer to rule a kingdom of happy subjects, don't you think? Well, I'm just exhausted from all this dreadful ruling." "Our show will be moving on soon, perhaps you'd like to continue your mission of merriment as part of our entourage?" "Oh, just a little jaunt over to Daggerfall for some mischief. Poor Emeric had such grand plans for today, but his dour queen will surely have something to say about that! I'm certain he'll seek out a champion after we arrive. You should volunteer!" I'll see you in Daggerfall then. "That's all for today, champion, but rest assured that your queen will call upon you tomorrow." While in Glenumbra or Stonefalls, you can overhear her performances with her fellow Jester Royalty. Jester King Jorunn: "This one has forged a humorousness for you fair queen." Jester Queen Ayrenn: "Oh, my! You shouldn't have. Let's hear it!" Jester King Jorunn: "What do you call a Bosmer who arbors eating his neighbors?" Jester Queen Ayrenn: "I—what …?" Jester Queen Ayrenn: "Oh! Hah! Hah! Ah … you really shouldn't have." Jester King Jorunn: "Your neck is most skinny for a ruler." Jester Queen Ayrenn: "Oh no! Is that concerning?" Jester King Jorunn: "Crowned heads are known for their heaviness, Jorunn's especially. He knows the secret to a long rule is a strong neck." Jester Queen Ayrenn: "How do you keep your neck as thick as your head? I must know!" Jester King Jorunn: "Shrug at every opportunity." Jester Queen Ayrenn: "Jorunn! I have an answer to all the dreadful fighting for the Ruby Throne!" Jester Queen Ayrenn: "No, silly! A beauty contest! All of Tamriel could bask in our regality and choose the leader they adore most!" Jester King Jorunn: "That would not be fair." Jester Queen Ayrenn: "Well, of course there could only be one possible winner." Jester King Jorunn: "Do not let it disparage you. The silkiness of Jorunn's back-hair puts many to shame." Jester Queen Ayrenn: "Hello my simple, cousins!" Jester Queen Ayrenn: "I know we have our differences, but I know behind all your gloomy, pallid, muck-speckled faces there's a hint of proud elven heritage." Jester Queen Ayrenn: "I only hope to inspire you all to take pride in that scant bit of nobility clinging to your lineage for generations." Jester Queen Ayrenn: "When I'm your empress—ow!" Jester King Jorunn: "This one thinks they like you!" Jester Queen Ayrenn: "In the isles, we shower our beloved leaders in flowers, but if this is the Daggerfall custom … thank you for welcoming me future subjects!" Jester Queen Ayrenn: "Ouch! Thank you! Mind the royal face! Oh! Cold one! I'm honored! This is mud, right?" Jester King Emeric: "I told you not to sniff the sneezing powder." Jester Queen Ayrenn: "Achoo! I—Achoo! I didn't! It's this dry air!" Jester King Emeric: "Ah, yes. I empathize. It's murder on the skin. Just look at me." Jester Queen Ayrenn: "Oh! You should get that looked at, you're practically a lizard!" Jester King Emeric: "Do you know the trouble with Morrowind feasts?" Jester Queen Ayrenn: "All the poisonings?" Jester King Emeric: "No, besides that!" Jester Queen Ayrenn: "The squishy bug glop?" Jester King Emeric: "Yes, but—"
Jester Queen Ayrenn: "The long silent glowering?" Jester King Emeric: "Everything comes out smoked …! But seriously, they really are dreadful, aren't they?" Jester King Emeric: "I don't know if I can stomach anymore of that belching!" Jester Queen Ayrenn: "I think it's got a melodic quality. Besides, if we stopped it, Jorunn might explode!" Jester King Emeric: "Not him! Those wretched lava flows!" Jester Queen Ayrenn: "Oh? Why do those vex you?" Jester King Emeric: "Let's just say I don't think Ashlands is the most accurate moniker if you're accounting for smell." Jester King Emeric: "Ayrenn, do you know the difference between Nords and pigs?" Jester Queen Ayrenn: "Oh! No, I don't think I do." Jester King Emeric: "Pigs don't turn into Nords when they drink!" Jester Queen Ayrenn: "I don't know that I've seen a pig drink." Jester King Emeric: "Bah, pearls before swine!" This page was last modified on 27 March 2019, at 11:16.